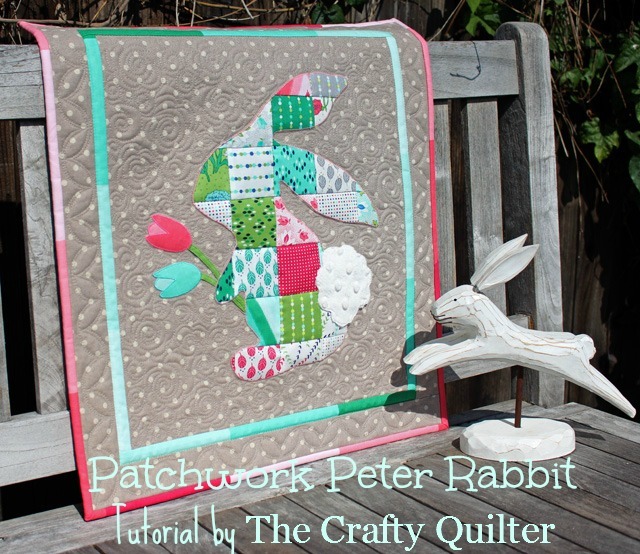 My Patchwork Peter Rabbit tutorial is here! I love this little guy so much and I’m so happy to share him with you! 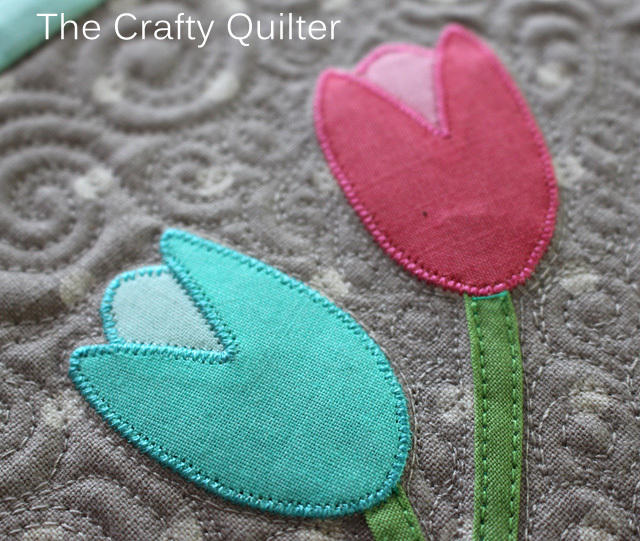 This is a simple project that anyone with a little applique experience could do. The piecing is very easy and quick. 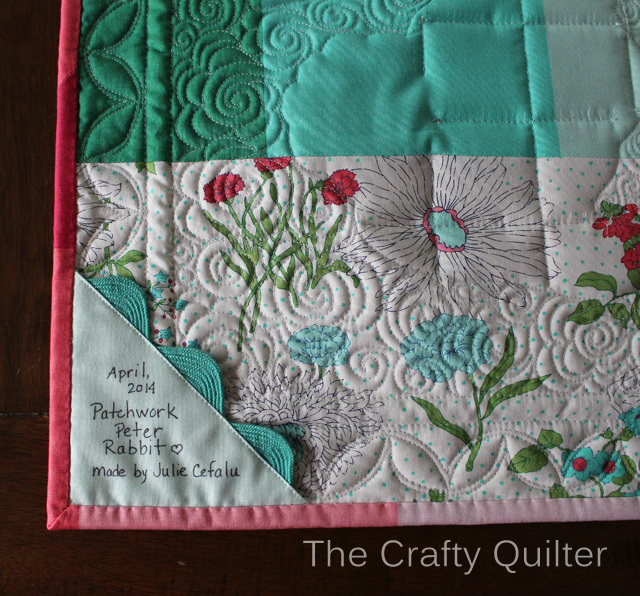 The original inspiration for this quilt came from my daughter’s preschool art project from almost 20 years ago! Am I that old? 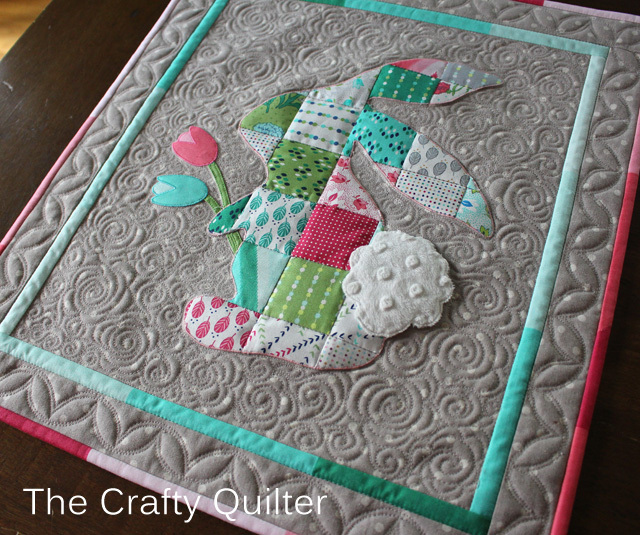 I’ve always loved this bunny and when I brought him out to decorate the house for April, I decided he needed to be in a quilt. I scaled the original bunny down to 75% and added my own tulips. For the fabric, I found more inspiration from this fat quarter bundle (and a mini charm pack) of Color Me Happy by V and Co. for Moda Fabrics. I wanted to use my mini charm pack and so a Patchwork Peter Rabbit was born. I love the floating border and the binding, too. I took advantage of the color block ombre fabric for this, and I love how it turned out! Sometimes this type of yardage is hard to figure out what to do with. I think I picked a winner! I also used this fabulous Linen Mochi Dot by Momo for Moda Fabrics, as my background and outer border. This was a dream to work with, and I love the texture it adds. And how about that fluffy tail? I love the Cuddle dimple fabric from Shannon Fabrics. 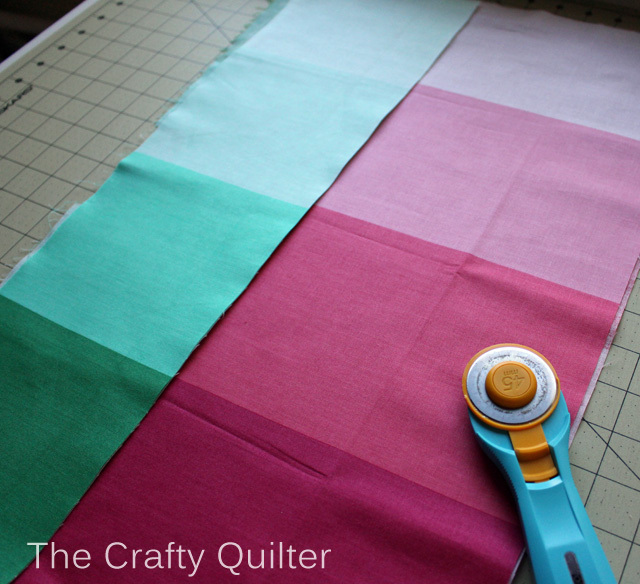 I used a similar technique when I made my Surrounded by Circles Baby Quilt for Shannon Fabrics. I also added a hanging sleeve. You can see my tutorial for this technique here. And I finally found a good use for my left over scraps of jumbo ric rak. I added it to my quilt label. How sweet is that? This label is easy to make. I cut a 5″ square of fabric and folded it in half diagonally, wrong sides together, forming a triangle. Then I stitched a small piece of rick rac to the folded edge of the triangle. I wrote my information with a Pigma Pen and then basted the triangle to the corner of my quilt, before adding the binding. 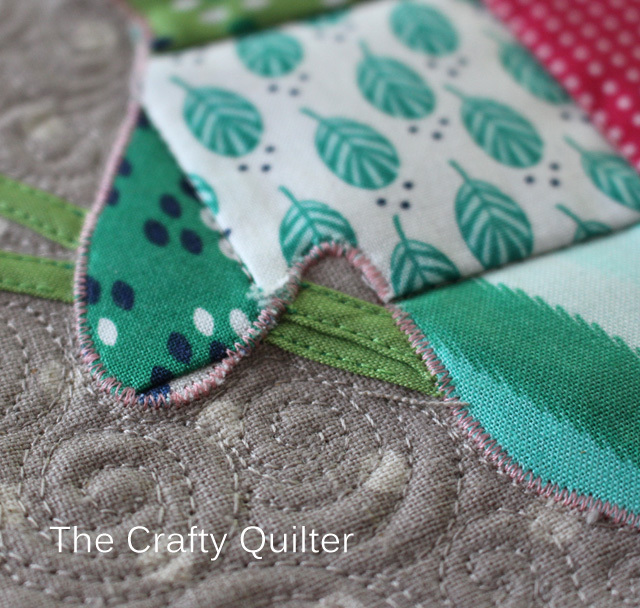 Once the binding is stitched, you wrap it around the quilt and it encases the raw edges of the quilt label too. When choosing a stitch for the applique, I decided that a zig zag stitch was the best choice considering all of the seam allowances at the raw edge of the rabbit. I wish I would have used a wider zig zag and maybe a shorter stitch length. At some spots, there is a little fraying at the seam intersections. I think it makes my rabbit look a little tattered, but I’m going with a worn look from being overly loved. If you need more information about raw edge applique in general, you can go to my Applique Series and get the whole scoop! Figuring out how to quilt this took longer than the actual quilting itself. I used a “seed” stencil along the border. I double stitched it, in other words, echo quilted it to give it some girth. I also stitched in the ditch around the inner border and within the patchwork of the rabbit. This entire project would normally take me two days to make if I didn’t have to take pictures of each step. So, what are you waiting for? 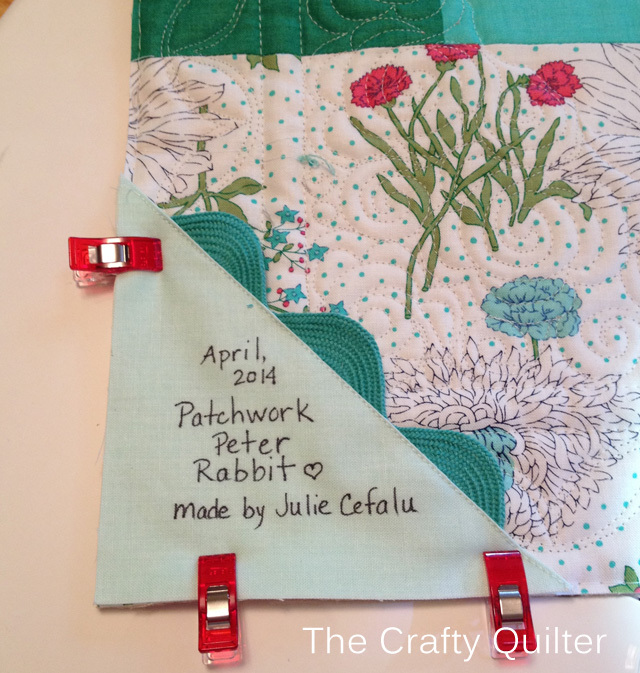 I think you could whip up your own Patchwork Peter Rabbit before Easter! I hope you all have a wonderful Easter (if that’s something you celebrate) and happy Spring to everybody! That is the cutest Easter thing I’ve seen in quite a while. Took me long enough to find it – and then thanks to Joy at Days Filled With Joy. 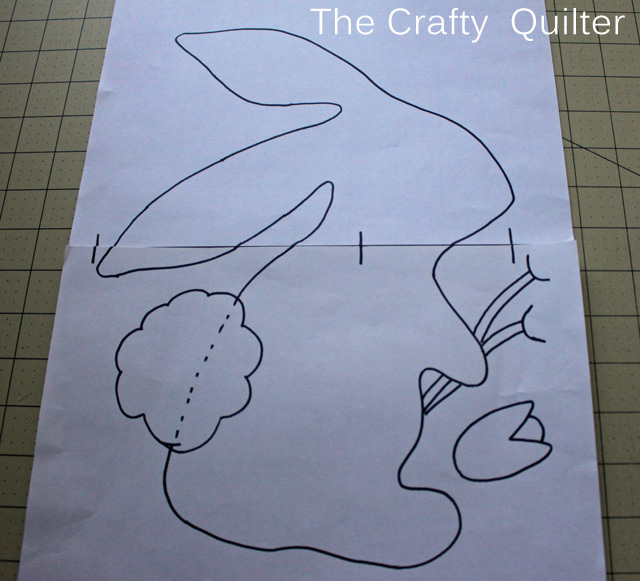 Pingback: 25+ Easter Bunny Quilt Patterns to Sew and More - Coral + Co.
Peter Rabbit is the best..at the top of my list to make as soon as I get settled in the new house! Thabks for posting! This is adorable!! Thank you so much for sharing your talent! Happy Easter! This is the cutest ever, can’t wait to make it! Hi Julie,the Peter rabbit tutorial is FAB! I am about to start on my fourth rabbit for the family as Easter is getting close, better than chocolate any day,plus it will last longer. Thanks so much for sharing this pattern. I love Easter and I love Rabbits. Thank You for sharing this adorable pattern. He is just too cute! Thank you so much for the tutorial! Adorable! And what a great idea for the tail! 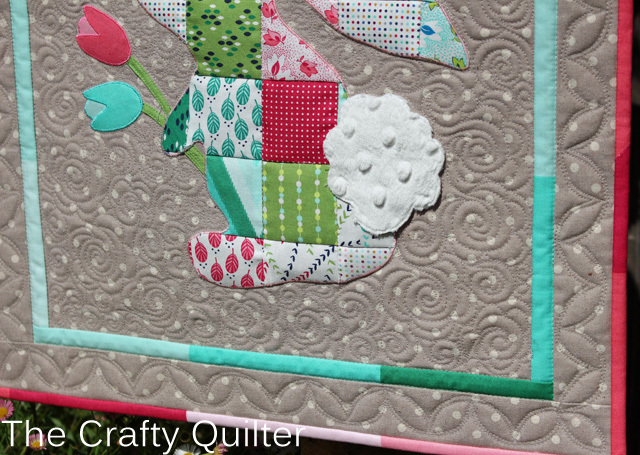 I love the patchwork and that delicious FQ bundle. Lucky you! Isn’t it great where inspiration takes us! About 20 years ago; who knows maybe more…. we received a Christmas card with an appliqued dove on it. I have saved it all this time to make it into a wall hanging. I think I even have fabric picked out to make it with. I will have to make this, it’s wonderful. I’ll bet your daughter is proud that she was your inspiration! The rabbit is so cute! 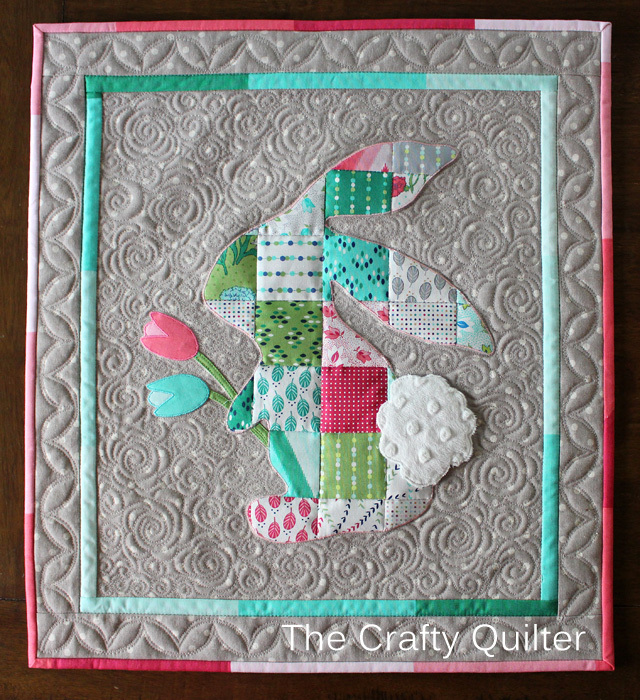 Nice work and your quilting is just awesome! Well done! I just love this little bunny wall hanging. I bought the fabric Friday and started it that night, today I have done everything but the borders and quilting. Everyone at the quilt shop that saw it today also loved it. Thank you so much for the idea and pattern. It will be on my wall sometime tomorrow. 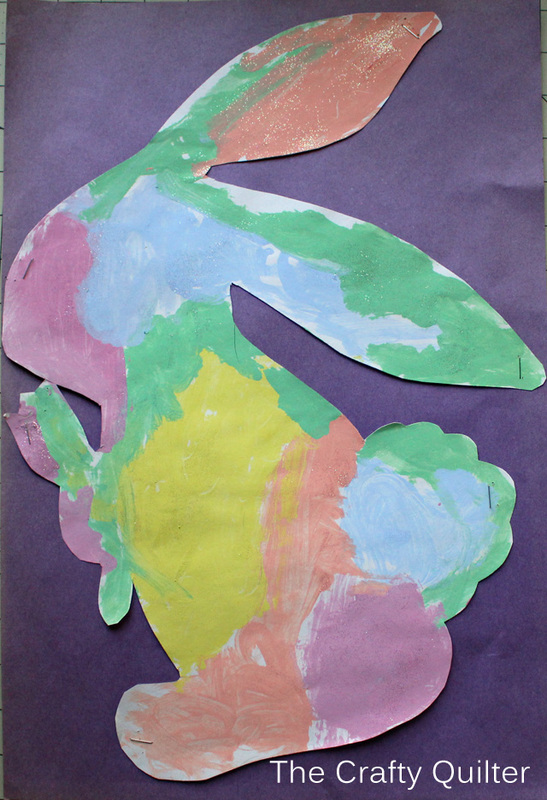 Your Patchwork Peter Rabbit turned out wonderful. By the way, the pink stitch that you used for your applique; I think it makes it look as if you have used piping all around it. Very cute! Have a lovely Easter. Such terrific work! The detail is terrific. I love the final piece. Love this! It really shows a sign of spring. Love the fabrics, the technique.. everything about it.Thanks for sharing! Beautiful! Love the wall hanging and the story. 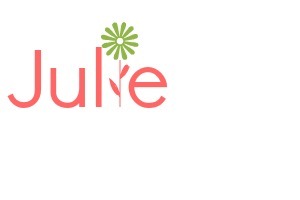 Thanks so much for sharing the tutorial, Julie. He’s absolutely gorgeous! How adorable! 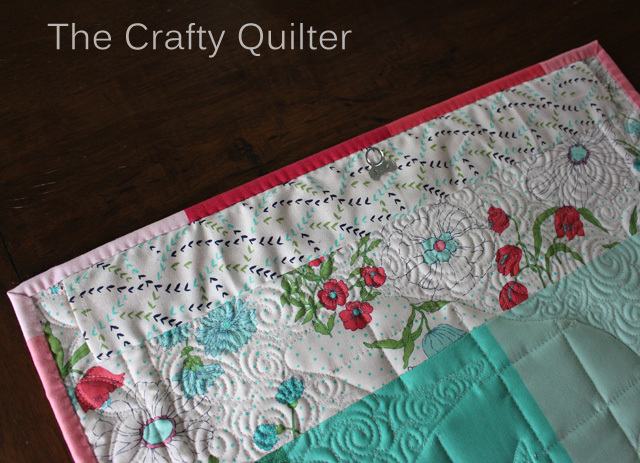 I love the choice of fabrics and your quilting is just perfect. I’m ready for spring! Peter never looked better! Thanks for sharing! 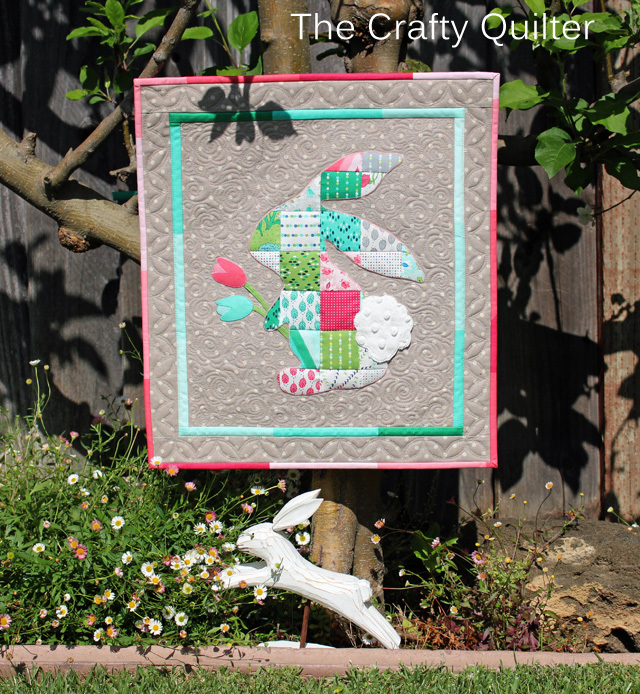 What a cute little bunny Julie and a wonderful tutorial! Thanks for sharing. It’s a beauty! I pin it for the next time! Thank you! Just love this bunny! Thanks for sharing all your tips and tutorials and your So Thankful Sunday blog! That is a gorgeous wall hanging! The border, the label, and the sweet inspiration–nice job! Thank you for sharing the pattern, so cute! Thank you so much for all the close-up photos. It’s a big help to beginners like me. 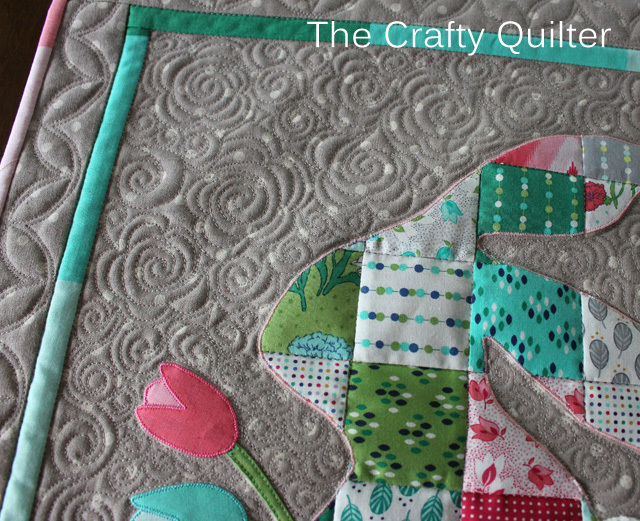 So cute and I love the quilting. 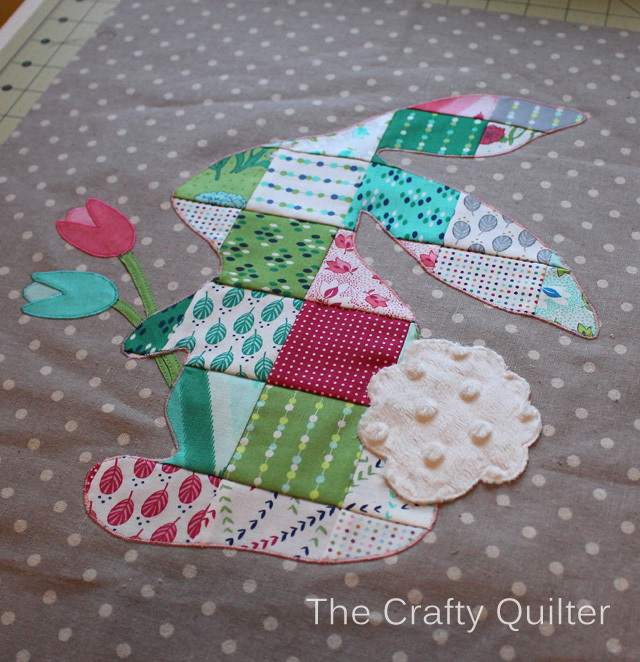 Your patchwork rabbit is adorable. Thank you for the great tutorial and Happy Easter to you and your family. 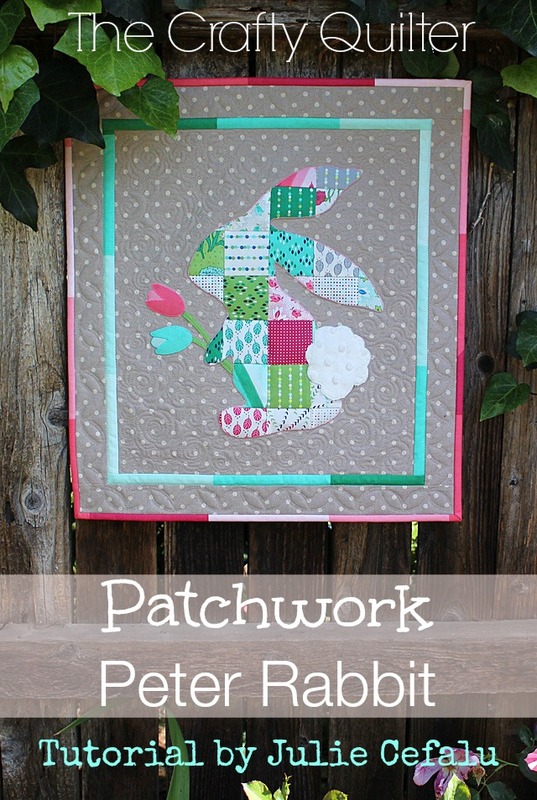 Patchwork Peter Rabbit is so darn cute! 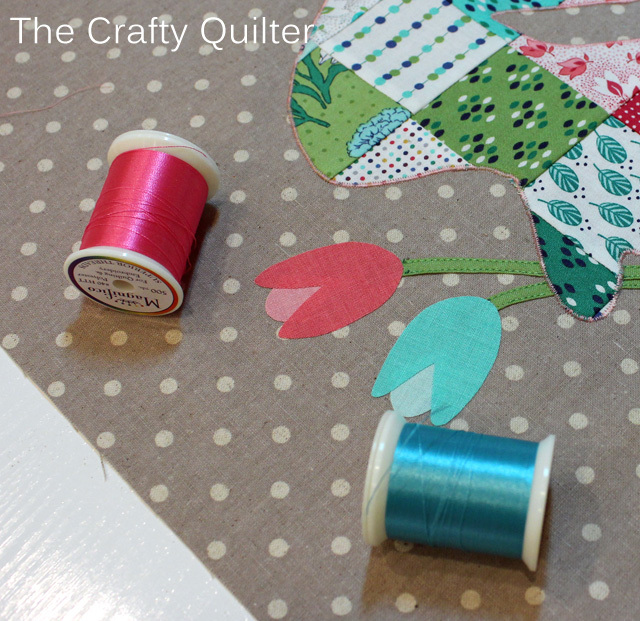 Thank you for the tutorial….I’ll try and squeeze this one in before Easter! 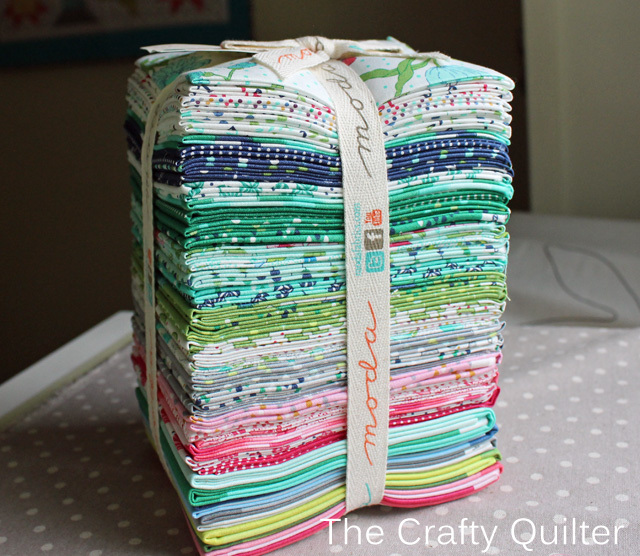 Oh my goodness I love the pile of fat quarters…..Can’t wait to find them in the store….And thank you so much for the Patchwork Peter Rabbit wall-hanging pattern…I’m going the hand appliqué it so it don’t fray….. This is adorable!! Thank you so much for sharing and Happy Easter! 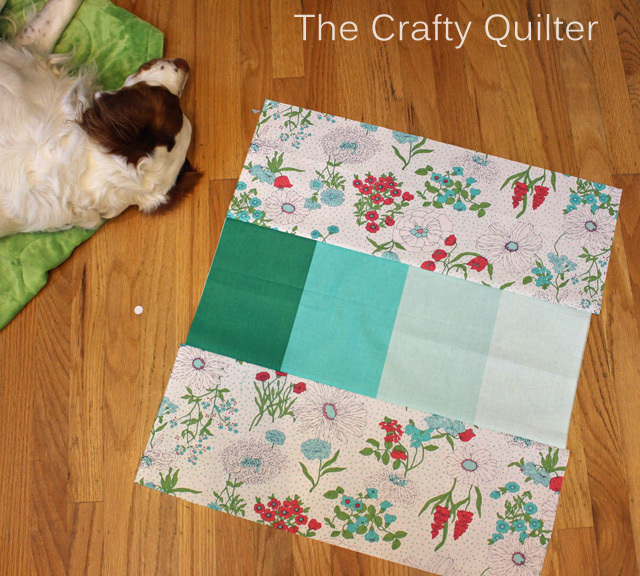 This is a really cute quilt! 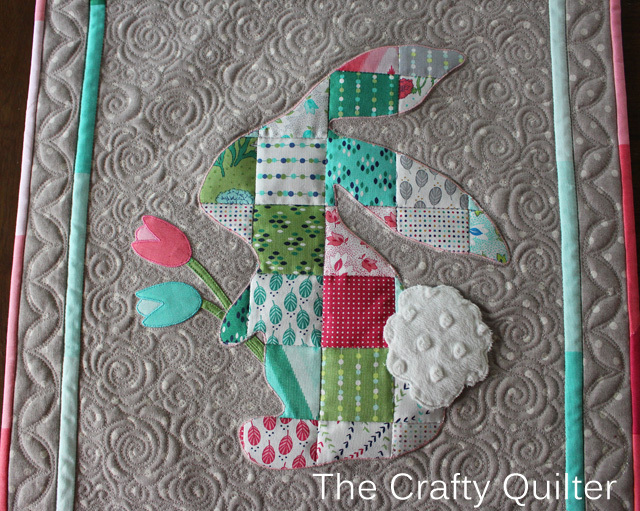 The patchwork bunny would look adorable on a baby quilt as well! He/she is perfect! Happy Easter. This is just so cute and pretty and fresh! Thanks so much for the pattern and awesome tutorial. These fabrics are just beautiful and so springy!! I love them. I will be making this wallhanging for next year, for sure!! I thought this little rabbit was adorable too. I want to make it for this Easter. I guess that means I better be getting to that right now!! This is SO darn cute! I love that you did it based on your daughter’s artwork. My daughter made a reindeer with the antlers being her hand prints and I saved it for YEARS!!! I dragged it out every Christmas and it was looking mighty worn. I finally copied it onto fabric and made her a pillow. She still has it on her bed! Peter is adorable…..can’t wait to make him!! !